A luxurious and contemporary combination of materials, the Curve round lamp table is a beautiful and practical addition to your space. This lamp table is ideal for a variety of spaces in the home. Perfect for sitting alongside your sofa for practical uses, allowing you to easily reach and store essentials. The table is also the perfect fit for dressing up an empty corner or wall in your home, the spacious top is ideal for lamps, plants and vases. The Curve round lamp table is a beautiful mix of materials combined in one curvatious design, giving it a modern and unique style. The sleek black glass contrasts with the rich walnut to create a strong and stylish impact, touches of chrome trim accentuate the contemporary look. 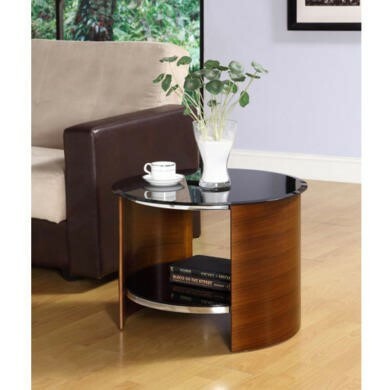 The Curve round table has a strong metal frame. The sides are real walnut veneer giving you the rich warm tones. The top and under shelf are toughened black safety glass. Simply wipe your table over with a dry cloth or duster to maintain a dust free surface. As the top and shelf are black glass add a spritz of polish now and again to really make your table shine. This table is delivered flat packed and self-assembly is required. It only takes four easy steps until your new side table is up and ready!